Deep drawing presses are available with triple action, double action with bottom cushioning press. These presses are used for sinks, bath tubs, surgical items, automobile parts, etc. Hydraulic punching presses are available in C-frame, 4-Pillars, 'H' type designs as per customers' requirements. These are used for industrial chains, automobile parts, etc. 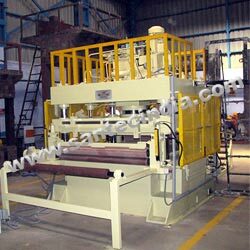 Hydraulic trimming presses can be produced as per customer's specifications & requirements. These are used in trimming operations for die-casting products, plastic sheets, etc. Powder compacting presses produces are used in a wide variety of applications. Having variable ram speeds & high tonnage in a smaller area, these presses have ability to dwell under pressure. These presses are available in 'C'- frame & range varies from 5 Mt to 100 Mt manual & auto, both operation. Ram speed according to the customer's requirements. Hydraulic blanking presses are used for blanking operations in all kind of sheet material may be aluminum, mild steel or SS. The tonnage is selected according to the blank size & material. SS kitchen sink drawing presses are most popular presses. They are available in double acting & single action design with bottom cushioning arrangement. Triple compression deep drawing presses are used where components are difficult to draw in double action type deep draw presses. Hydraulic coining presses are available in 'C' type & 'H' type frame in a capacity up to 500 tones. Bath tubs drawing presses are also most popular ranges of press. These are used to produce SS bath tubs. Compression molding presses are available in all latest features to suit wide range of industrial applications. H frame type presses or 4-columns type presses are heavy duty type. The frames are fabricated by ultrasonically tested quality profiles to suitable thickness.